SMALL & POWERFUL SOUND: True wireless bluetooth connection that’s tangle-free and HD quality sound. You can wear them comfortably, hidden and suitable for every activity. COMFORTABLE, CONVENIENT & SECURE: The X6(ZR100) are TRULY WIRELESS earbuds. The best part… NO CABLES between the earbuds or anywhere close to them. Enjoy hours of music listening without any fuss of tangled wires. The True Wireless Bluetooth earbuds are perfect for any sport. From working out at the gym to running, hiking, or just basically commuting, these earbuds are a perfect fit for any occasion. GO DAYS WITHOUT CHARGING: Feel confident that your battery won’t run out with 10 hours of charge life and ‘on the go’ charging case (the charging base is the battery). REALLY SMALL CHARGING CASE: The small charging case (included) is so compact and so powerful that will charge on the go (up to 5X). 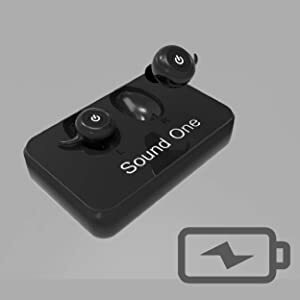 STRESS FREE CONNECTIVITY WITH MICROPHONE AND MULTI-FUNCTION BUTTON: The earbuds connect to each other effortlessly by just taking them out of the charging case. 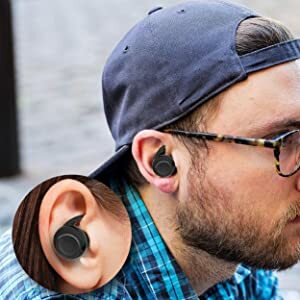 Stop trying to connect your earbuds together and then connecting them to your phone with other earbuds that promise more, the Photive True Wireless Bluetooth Earbuds are truly stress and hassle free. With a single button, you can take a call, play music. Finally, a pair of Sweat proof Stereo Bluetooth Headphones that are truly wireless. The TWS Micro from Photive offers unparalleled convenience in a small package. 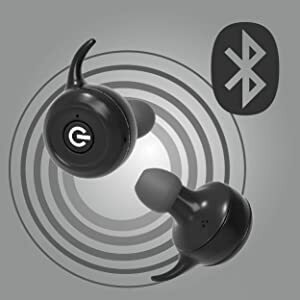 With full audio streaming via Bluetooth, these compact earphones let you jam to your favorite beats while offering complete freedom of movement. Zero wires means zero distractions,perfect for those who Workout, Exercise, Gym, Running, Jogging, Hiking, commuting so you can leave those snagged wires and tangled cords in the past, and focus on what really matters. Let nothing stand in the way of a killer workout, seamless run, or blissful practice. Crush your goals and keep moving forward. It has never been more important for your earphones to fit well. Lightweight and sweat-proof, these earbuds are designed with an emphasis in ergonomics, so they feel secure and comfortable in your ears. They’re easy to wear for hours, and perfectly suited for sporty and sweaty activities. You can choose from several different sizes of included earbuds for a precise and customized fit, so they’ll stay attached whether you’re hitting the trails or the gym. Boasting a minimalist, yet modern look, the TWS Micro earbuds look great with every outfit. Long-lasting rechargeable battery, for hours of uninterrupted playtime. When they run out of juice, however, charging is no chore. 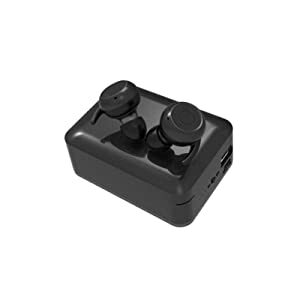 Simply place the earbuds in the included storage case, which conveniently doubles as a battery pack. 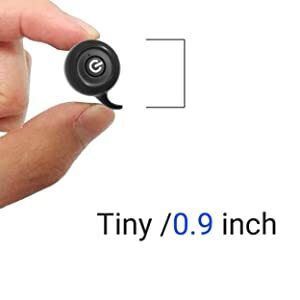 The earbuds connect to each other effortlessly by just taking them out of the charging case. Our new Auto-connect function will automatically connect to your last paired device. It has never been more important for your earphones to fit well. Lightweight and sweat-proof, these earbuds are designed with an emphasis in ergonomics, so they feel secure and comfortable in your ears. 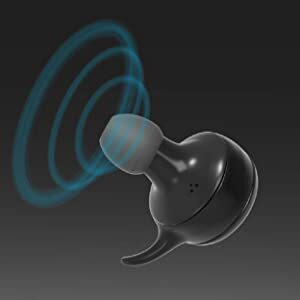 Compact, yet powerful, these sporty earbuds offer serious sound. Equipped with premium audio components, the TWS Micro earphones deliver crisp, balanced audio that nails the full spectrum of low and high frequency tones.